One of the provisions of the Post-9/11 GI Bill is the ability of a military member to transfer some or all of their GI Bill education benefits to a spouse or child(ren). The law has left it up to the Department of Defense to establish eligibility criteria for transferring benefits, and DOD has now announced the policy. Basically, any military member serving on active duty or in the Selected Reserve on or after August 1, 2009 will be eligible to transfer his or her benefits as long as he or she qualifies for the Post-9/11 GI Bill in the first place and meets specific service requirements. The basic service requirements are that the member must have at least six years of military service, and agree to serve an additional four years at the time of enrolling in the transfer program. What this means is that military members who have retired or separate prior to August 1, 2009 are not eligible to transfer benefits, even if they are eligible for Post-9/11 GI Bill benefits (any service member with more than 90 days of active duty, after September 11, 2001, who is still in the service or has an honorable discharge, is eligible for the new GI Bill). Members transferred to the Fleet Reserve, or Individual Ready Reserve (IRR) before August 1, 2009 are also ineligible to transfer benefits (unless they subsequently return to active duty or active reserves). There are a few exceptions to the four years of additional service rule, if the service member is not able to re-enlist due to a DOD or service policy. They must, however, serve the maximum time allowed before separating from the military. For example, if an enlisted member cannot re-enlist or extend his/her enlistment for four years because of High Year of Tenure, or an officer cannot extend their commitment for four years because of being passed over for promotion, they could still participate in the GI Bill sharing provision, as long as they stayed in the military for the maximum period allowed. * Those eligible for retirement on Aug. 1, 2009, would be eligible to transfer their benefits with no additional service requirement. * Those with an approved retirement date after Aug. 1, 2009, and before July 1, 2010, would qualify with no additional service. * Those eligible for retirement after Aug. 1, 2009, but before Aug. 1, 2010, would qualify with one additional year of service after approval to transfer their Post-9/11 GI Bill benefits. * Those eligible for retirement between Aug. 1, 2010, and July 31, 2011, would qualify with two additional years of service after approval to transfer. * Those eligible to retire between Aug. 1, 2011, and July 31, 2012, would qualify with three additional years of service after approval to transfer. Under the new GI Bill, members receive 36 months of education benefits. That's the equivalent of four nine-month academic years. Under the benefit transfer program, all or a portion of the benefits can be transferred to a spouse, one or more children or any combination. 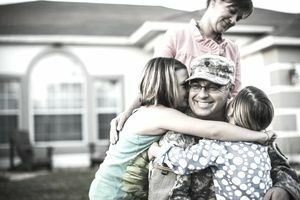 The family member must be enrolled in the Defense Eligibility Enrollment Reporting System (DEERS), at the time of transfer, to receive the benefits. A child’s subsequent marriage will not affect his or her eligibility to receive the educational benefit; however, after an individual has designated a child as a transferee under this section, the individual retains the right to revoke or modify the transfer at any time. Even after transferring the benefits, they remain the "property" of the servicemember who earned them, who can revoke them or redesignate who receives them at any time. The rules make it perfectly clear that the benefits cannot be treated as "joint property" in cases of divorce. * May start to use the benefit immediately. * May use the benefit while the member remains in the Armed Forces or after separation from active duty. * Is not eligible for the monthly stipend or books and supplies stipend while the member is serving on active duty. * Can use the benefit for up to 15 years after the service member’s last separation form active duty. * May start to use the benefit only after the individual making the transfer has completed at least 10 years of service in the Armed Forces. * May use the benefit while the eligible individual remains in the Armed Forces or after separation from active duty. * May not use the benefit until he/she has attained a secondary school diploma (or equivalency certificate), or reached 18 years of age. * Is entitled to the monthly stipend and books and supplies stipend even though the eligible individual is on active duty. * Is not subject to the 15-year delimiting date, but may not use the benefit after reaching 26 years of age.